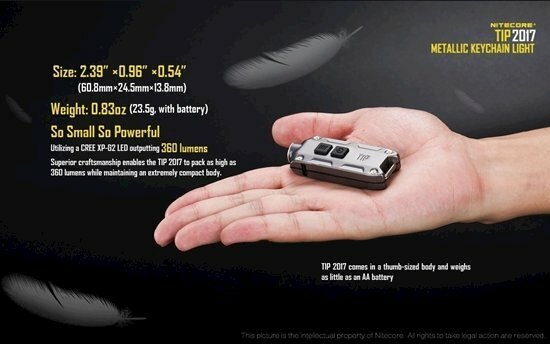 The Nitecore TIP 2017 edition is every bit as powerful as its predecessor with new dual modes and a detachable clip. The new "Daily" and "Constant On" modes give users more control over their light based on their intended frequency of use. In Daily mode the Tip will automatically shut off after 30 seconds of use meaning you'll never have to worry about leaving your flashlight on again. For those who desire more control, Constant On mode will stay on until turned off. BRIGHTEST KEYCHAIN LIGHT EVER - Produces 360 lumens with four brightness levels that allow you reach up to 74m. This completely destroys common AA battery powered lights which only reach 180+ lumens on a single battery or 345+ lumens on 2 batteries! INCREDIBLY LIGHTWEIGHT + DURABLE - Constructed from aero-grade aluminium, it weighs only 23.4g with built-in battery! The rear key ring is capable of holding up to 29kg! RECHARGEABLE + LONG BATTERY RUNTIME - Built-in USB charging port and Li-ion battery provides up to 90 minutes run-time at 150 lumens and over 46 hours run-time on lower modes. EASY TO OPERATE - Single-handed operation with dual switch design. Separates on/off operation and mode selection. Prevents accidental on and battery drain with pocket clip and smart controls.